Groschen (Latin: Grossus, German: Groschen , Italian: grosso or grossone, Czech: groš, Lithuanian: grašis, Estonian: kross, Polish: grosz, Albanian: grosh, Hungarian: garas, Russian, Ukrainian, Macedonian and Bulgarian: грош (groš), Romanian: groș) was the (sometimes colloquial) name for a coin used in various German-speaking states as well as some non-German-speaking countries of Central Europe (Bohemia, Poland) and the Danubian Principalities. 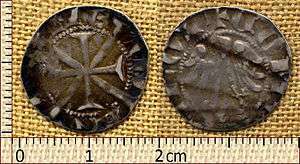 The name, like that of the English groat, derives from the Italian denaro grosso, or large penny, via the Czech form groš. The Qirsh (also Gersh, Grush, Γρόσι (Grósi) and Kuruş), Arabic, Ethiopian, Hebrew, Greek and Turkish names for currency denominations in and around the territories formerly part of the Ottoman Empire, are derived from the same Italian origin. Names like Groschen, grossus/grossi, grosso, grossone, grosz, gros, groš, groat, Groten, garas etc. were used in the Middle Ages for all thick silver coins, as opposed to thin silver coins such as deniers or pennies. Historically it was equal to between several and a dozen denarii. Later the tradition of Groschen was dropped in most states while others continued to mint only coins smaller than the original coin. In Poland for example, since 1526 these included coins of 1⁄2 grosz, 1 grosz, 1 1⁄2 grosz, 2 grosz, 3 grosz, 4 grosz and 6 grosz. Their weight gradually dropped to 1.8 grams (28 grains) of silver and since 1752 they were replaced by copper coins of the same name. Likewise, in Germany Groschen remained a slang term for the 10 pfennig coin, thus a 1⁄10 part both of the (West German) Deutsche Mark and the East German Mark. The word has lost popularity with the introduction of the Euro, although it can still be heard on occasion, especially from older people. In Ukraine, grosh is still a slang term for the kopiyka, a 1⁄100 part of a hryvnia. The Ukrainian and Belarusian word for money, hroshi, ultimately derives from this term also. In Bulgaria, the grosh (Cyrillic: грош) was used as a currency until the lev was introduced in the 19th century. In Bulgarian, Macedonian and Croatian and Serbian, the term has been retained as a general word for a coin or currency in a number of money-related proverbs and sayings, and can also be regularly encountered in folk tales or stories set vaguely in the past. In Palestine during the British Mandate, a grush was a coin with a hole in it, valued at 1⁄100 part of a pound. It was named after an Ottoman coin. When the pound was replaced by the lira after Israeli statehood in 1948, the name was transferred to a coin (no longer with a hole) worth 1⁄100 of a lira. The name persisted for a while after the lira was replaced by the shekel in 1980, but it gradually lost its standing as the name of a certain coin. Now it is a slang for a very small value. In Germany, the name Groschen (both singular and plural) replaced Schilling as the common name for a 12 pfennig coin. In the 18th century it was used predominantly in the northern states as a coin worth 1⁄24 of a Reichsthaler (equal to 1⁄32 of a Conventionsthaler). 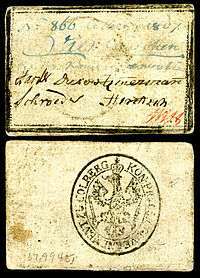 In the 19th century, beginning in 1821 in Prussia, a new currency system was introduced in which the Groschen — often called the Silbergroschen (Prussia, from 1821) or Neugroschen (Saxony, from 1840) to distinguish it from older Groschen — was worth 1⁄30 of a Thaler or Taler. Following German unification and decimalisation, the Groschen was replaced by the 10 pfennig coin and Groschen remained a nickname for the 10 pfennig coin until the introduction of the euro. For the same reason, the name Sechser (sixer) remained in use regionally for the half-Groschen coin, 5 Pfennigs. There is a Beethoven rondo for piano, opus 129 (1795) entitled "Die Wut über den verlorenen Groschen" (literally "The rage over the lost groschen", but known as "Rage over a Lost Penny"). Austria introduced the Groschen in 1924 as the subdivision of the schilling. It was restored, along with the schilling, in 1945 and continued in use until the introduction of the euro in 2002. The type was also minted during various times in the Duchy of Luxembourg, such as the 22 millimeter 1⁄2 gros produced from 1418 to 1425 under John III the Pitiless, Duke of Bavaria, bearing slightly varying inscriptions of "IOAH DVX BAVAR Z FILIVS" on the obverse, and "MONE NOVA LUCE BURS" on the reverse. Wikimedia Commons has media related to Groschen. ↑ Tony Clayton (20 September 1997). "Four Pence". Coins of England and Great Britain. Archived from the original on 7 October 1997. ↑ Philologos (pseudonym), "Money Hole", The Forward, November 28, 2003.